I can’t resist pansies this time of year. They just look like spring. Home improvement projects took me on multiple trips to the hardware store this past weekend and on the last of these trips, 3 six-packs of pansies followed me home. I’m not an avid gardener. Perhaps because it’s something my mom and sister are both naturally good at and so I’ve stayed out of it. Based on the historical record, green things turn brown when I touch them. I’m much better with mammals; they get in your face when you forget to feed them. I have hopes that I’m improving in this respect. I have a maiden hair fern in my bathroom that I’ve managed to keep alive for several months now. Anyone who knows my track record with this particular species of plant is probably mumbling its last rites under their breath right now. Bite your tongue. We’re getting along okay. Being homebound changes your perspective. 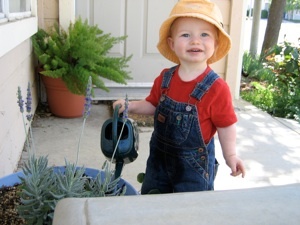 Since Luke became mobile we’ve been spending a little time each afternoon on the front porch where the sunshine is. This bit of the house is one that I’ve always ignored as I came home from work, car keys in hand and dinner on my mind. But after a period of time sitting on my cemented front stoop everyday, I began to poke around plant vendors looking at green things. First I brought home a large fern, one that the guy holding the hose at the nursery assured me was “sturdy.” I named him Bob, due to a striking similarity between this plant and a certain psychopathic clown we all know and love. And no, smarty pants, I don’t typically name all my plants. But me purchasing a plant that I actually intended to care for myself was a big step and I wanted to get this relationship off on the right foot. Bob has since been joined by a couple of succulents, a pineapple, some unidentified pink thing in a hanging basket, and a nice litter lavender. I killed the pineapple plant, but I don’t claim full responsibility for that one. It had no business being in this climate to begin with and I didn’t exactly invite it to live here. It was a stray. The lavender lives in big metal bucket which once held beer bottles at my wedding. Reduce, reuse, recycle. Today it made room for a little clover plant Shawn won at a work contest last month and a few of those pansies that came home from the hardware store. I like buying plants at hardware and grocery stores. I figure they’ve already been fairly well neglected and maltreated so going to my house will be less of a shock. It’s not a garden that has undergone any sort of organized planning and I never go hunting for specific vegetation with which furnish it. But every now and again, when I’m out and about, some little plant in a plastic pot will catch my eye and wander home with me. It’s not much, but I’m kind of fond of it. And it’s growing.